US iPhone users can now order a case containing an NFC microSD card online and use it to make payments with their mobile phone. An Android version will be added during the second quarter of 2012 and there are plans to make the technology available internationally from the end of the year. NFC microSD technology supplier DeviceFidelity has begun shipping an NFC mobile payments solution direct to US consumers, via a new venture called Moneto. 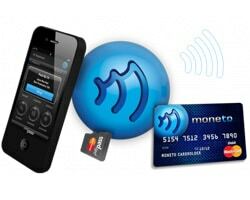 The Moneto service is built around a microSD card containing both an NFC antenna and an NFC secure element that comes pre-loaded with a MasterCard PayPass prepaid card account. Two versions are planned: a microSD plus signal booster solution for Android phones and an iCaisse case for iPhones — which don’t have a microSD slot — into which the microSD card is inserted. The iPhone version is compatible with the iPhone 4S, iPhone 4, iPhone 3GS, and iPhone 3 and is available to order online now for US$79.95. Android versions compatible with a number of handset models will be available for $39.95 in the second quarter of 2012 and support for additional phones will be added throughout the year. The prepaid account is issued by University National Bank, carries a monthly service fee of US$4.95 and can be reloaded via a range of bank and card transfer methods. A companion prepaid MasterCard is also provided, allowing users to make payments from the account at merchants that do not accept contactless payments. Once they have received their Moneto hardware, users simply download the Moneto app and activate their account to begin making NFC payments and to view their account balance and transaction history on their mobile phone. DeviceFidelity’s NFC technology has been widely tested by Visa but, until now, it was only available to selected customers of the banks conducing the trials. The launch of Moneto marks the first time that any consumer has been able to purchase DeviceFidelity technology at retail, although availability is restricted to US consumers at the present time. Initial response to the Moneto concept has “been fabulous, much higher than what we expected,” DeviceFidelity’s COO Amitaabh Malhotra told NFC World. The company is now “looking closely” at expanding Moneto into the Canadian and European markets “toward the latter part of this year” and is actively looking for partners to bring the service to market in a number of countries.